Bark Bar Grand Opening Pawty! Click on the arrows below to view all of the photos from the Pawty! [NEWS] Ground Breaking at Bark Bar! Thank you all so much for helping the Bark Bar team succeed on Kickstarter! Our Kickstarter was 246% funded by 146 backers! With the money, we plan to build the best gosh-darn dog park and bar in the country! WAAAAHOOOOOOOOO! Thank you - all 146 of you - who believe in our wacky idea and backed us! Now, the fun begins. We've applied for our building permit and should be starting construction this week. Until then, we will be working hard on designing the best darn dog park $13,536 can buy! This article was originally published October 2, 2016 at 3:45 a.m. 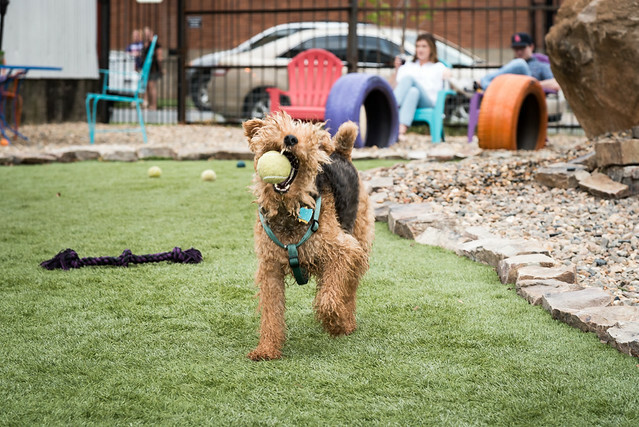 Updated October 3, 2016 at 5:45 a.m.
Arkansas Democrat-Gazette - The list of challenges facing the owners of Bark Bar, a combination dog park and watering hole for humans, is lengthy. ARKANSAS BUSINESS On Monday, Jan. 9, 2017 12:00 am - Bark Bar, the dream of a couple of dog-loving Little Rock women, is several steps closer to reality, says Elizabeth Michael. She and business partner Cara Fowler have raised all the money they need to open what Michael describes as “Arkansas’ first off-leash dog park and restaurant/bar,” in a former church that once housed Dreamweavers Inc. at 1201 Spring St. in the SoMa neighborhood.